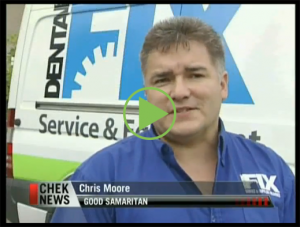 Chris Moore, Dental Fix RX franchisee, helped rescue a child from a car crash despite the strong odor of leaking fuel from the car. Franchising as a whole is evolving. In today’s industry, opportunities stand alone. It is no longer about who is behind the franchise, as much as what the franchise is all about. This change has allowed for more specialized opportunities –targeting specific niches– to emerge. In 2009, Dental Fix was created after its founders decided to look for a recession-proof business model that could offer a high return-on-investment. Dental equipment repair was the answer since it provided a need-based service. After all, no matter how bad the economy is, dentists will always need to have their equipment serviced or repaired. In addition, as medical equipment becomes more sophisticated, costs continue to escalate, making it more affordable for dentists to repair existing pieces, rather than buy new equipment. However, what made Dental Fix a truly unique business opportunity was the implementation of a new and better way to deliver this service. Dental Fix’s founders envisioned mobile centers that could deliver high-quality and immediate service to dental offices through a network of highly-trained franchise professionals. They wanted to remove the need for dentists to ship their handpieces to repair centers, considerably reducing their waiting time and saving them money. The concept has been so well-received that Dental Fix is on pace to sign more than 70 franchises this year alone. To date, the company has sold over 125 franchises and established a presence in more than 80 territories in North America. Besides its mobile aspect, Dental Fix also introduced three key ingredients to its business model that sets it apart: no royalties, protected territories and a minimum customer guarantee. Instead of charging franchise owners an ongoing six percent royalty fee, the company charges a monthly support fee that includes sales and marketing, technical assistance, accounting and account management services. This kind of support saves franchisees’ time, so they can focus on servicing equipment and generating profits. The fee is based on the number of dentists in a territory. Protected territories ensure that there is only one franchisee operating in a predetermined geographic area. This type of exclusivity allows franchise units to capture more business and provides greater growth potential. These territories have been divided by zip codes throughout all of North America. As a way to stand behind its brand and business model, Dental Fix established a minimum customer guarantee policy. Franchise owners who don’t achieve a minimum number of customers in the first year of operation are refunded their $25,000 initial franchise fee. After all, a franchise company that is not committed to the success of its owners shouldn’t be in business. These three components have made Dental Fix an attractive and successful venture. With limited competition –mostly in the form of distributors– the franchise company also offers a more personal approach to service. Mobile centers in each market are operated by local entrepreneurs servicing local dentists. It is a business-to-business approach. Compared to other types of franchises, B2B franchises have proven to be a successful model. Their popularity and rapid growth are due to the many advantages they offer. In Dental Fix’s case, franchisees have access to a more traditional schedule since they operate during doctors’ hours and their operating expenses are smaller, since overhead is pretty much non-existent in this business model. Also, since their clients are business professionals, the transition from a corporate environment to Dental Fix’s franchise system is much easier. When most people think franchise, they think restaurant. The truth is that a fast food franchise –or even a retail franchise– is just the tip of the iceberg when it comes to finding the right business opportunity. In this day and age, the options are unlimited. The key is to find the one that is right for you.